A Makeup & Beauty Blog – Lipglossiping » Blog Archive Deal Alert: Cheap hair styling tools online at Tesco! I was just browsing the Tesco website and discovered that there are a number of hairstyling tools to be had at a decent saving. I thought that with the “party” season just around the corner, this could be of interest to some of you. I wish I had more dedication to making my hair look nicely done, I always feel better when it looks less bird’s-nesty but when you have to prioritise time in the mornings, something’s gotta give and hair is just way down there on the list of priorities. Anyway, here are the offers on cheap hair styling tools on the site that caught my eye… anyone know what the TRESemme “big hair-alike” is like (number 2)? 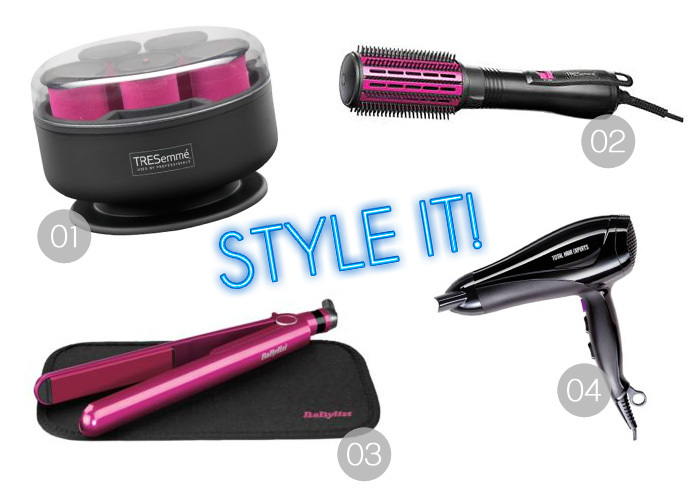 What hair styling tool could you not live without? Mine is the modest hairdryer, my fringe looks like a pair of curtains without it. Hair dryer here too, for the same reason. I’m saving for a posh Parlux one.